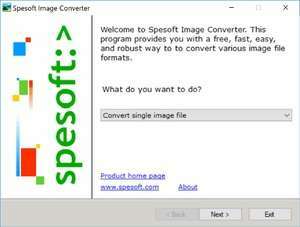 Spesoft Image Converter is a useful image converter which includes a handy wizard which allows you to convert your images between various different formats such as the most popular on the web: GIF, PNG, JPG and more. The converter is compatible with at least 70 different image formats and can work as both a single image formatter or a batch image converter, the latter allowing you to change the format of many image files at once including those on your digital camera. The program doesn't just convert images between different formats; it can also resize your images for web uploads or email sharing and retains the aspect ratio, depending on the original width or height of the image. One last thing that this freeware image converter can do is rotate the images by 90 degrees or 180 degrees in the direction of your choice (clockwise and counter-clockwise). Version 2.75 is a freeware program which does not have restrictions and it's free so it doesn't cost anything. For security reasons, you should also check out the Spesoft Image Converter download at LO4D.com which includes virus and malware tests. Additional screenshots of this application download may be available, too.